First off, a bit of housekeeping. You may have noted it’s May 1st, which usually means a new Find of the Month. Rest assured, that post is coming – I’m holding it off by a day simply because of some very exciting news and reveals from this month’s featured brand won’t be available till then. So to tide you over in the meantime, I have an equally great event and collection of gift ideas to profile. With that in mind – how many of you know someone that’s been touched by cancer? I know several people – including young women like myself – and it isn’t pretty. Literally. Look Good Feel Better is an incredible not-for-profit organization that works with women, men, teens and children to help them overcome the physical, appearance-related side effects of cancer treatment. On Saturday, May 3, Shoppers Drug Mart stores across the nation will be hosting The Makeover Event. Tickets are $10, with $5 going to Look Good Feel Better and $5 for you to spend on product while perusing Shoppers Drug Mart’s amazing beauty lines. During these exclusive gala events, you’ll enjoy complimentary makeovers and skincare consultations while munching on delicious refreshments, taking home free samples, and maybe even walking away with a prize. All you have to do to snap up a ticket is speak with one of the beauty consultants in the Shoppers Drug Mart Beauty Boutique. Spring is in the air and you can always count on philosophy to deliver some fresh new scents to match the sunny mood we’re all feeling right now. Both of these gift sets are just hitting store shelves right now, and each features three of philosophy’s signature 3-in-1 bath products (shower gel, shampoo and bubble bath, oh my!) Whether you’re buying for a diehard philosophy fan or a newbie to the brand, they’ll flip for these two summery sets. Hooray for Sorbet channels a fruity, creamy cup of this delicious sweet treat – perfect for scrubbing up to greet the morning. 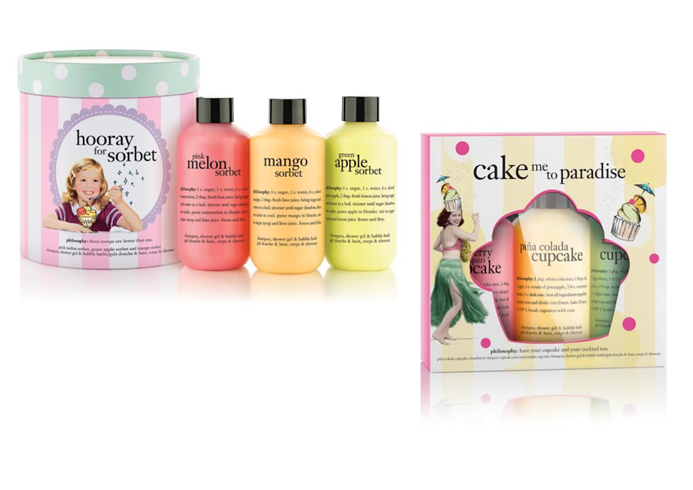 Meanwhile Cake Me to Paradise combines the delicious fragrance of fresh-baked cupcakes with tropical scents like pina colada, strawberry daiquiri and mint mojito. At this price point, it’s an ideal gift for a good friend (or a lovely indulgence for yourself). If you loved the original scrumptious, candy-laced incarnation of this fragrance by Katy Perry, then you’ll definitely want to snap up this limited time spinoff. Available exclusively at Shoppers Drug Mart locations, this new twist is rich with summer berries like purple plum, mulberry, blackberry and elderberries, for a fresh, fruity scent. Of course, it wouldn’t be Katy Perry without a little sugar involved: caramel and liquid praline are also prominent, along with some soft floral undertones. The result is a scent that literally seems good enough to eat (only don’t, for real). The fab price makes it a cute gift for your niece or the Katy Perry fan in your life. One of the fun things about perusing Shoppers Drug Mart is the opportunity to check out their exclusive lines like Quo, which is always coming up with fun, limited-edition collections. 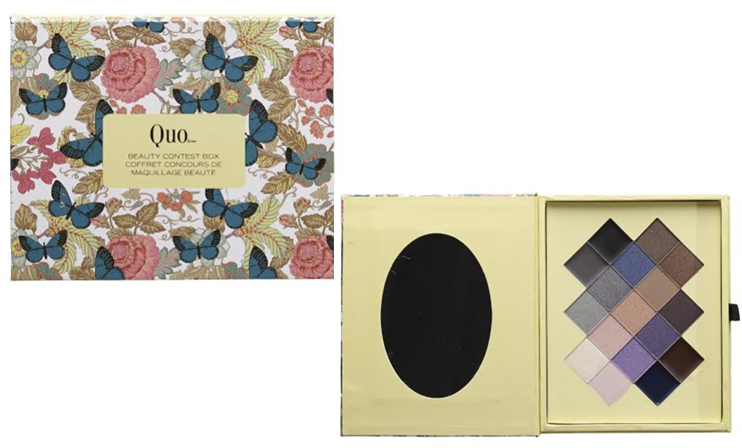 For Mother’s Day they’ve launched a set of five new products, including the oh-so-pretty Beauty Contest Box pictured above. Perfect for traveling, this compact collection includes 13 cool-hued shadows, four cream liners to make your eyes pop, and two blushes. 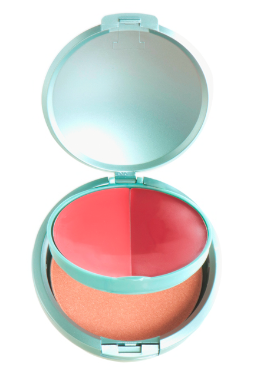 It’s an amazing bang for your buck and would surely make any mom glow just a little brighter upon opening (and using). If you really pressed me, I’d probably tell you that DuWop is my favourite brand to buy from when browsing the shelves at Shoppers Drug Mart. It’s not available at other major beauty retailers, yet it carries really innovative, special products (their BrowWow palette alone is worth a look). I took a peek at some of their latest launches and this product caught my eye as a great go-to for ladies toting small purses or travel bags. Offering two gel-based cheek stains that can be mixed and matched to create your ideal shade, as well as an anti-orange bronzer, this is a great way to get that summer fresh glow in an instant. The nail polish section of Shoppers Drug Mart makes it incredibly difficult to walk out without a new bottle or two in your shopping basket. And with prolific innovators like Sally Hansen constantly launching new collections, good luck not splurging on a bottle or two to craft the perfect at-home mani/pedi. The new Complete Salon Manicure line from Sally Hansen promises to deliver salon-level quality, with seven salon benefits in one easy-to-apply formulation. The softly hued, limited-edition Pastels on Point collection channels ballet slippers, lush bouquets of flowers, and the bright shades of a tropical landscape – making them an ideal pick to go with all those cute new spring clothes you’ve stocked up on. All of these gift ideas are just a preview of what Shoppers Drug Mart carries in their Beauty Boutiques. If you haven’t paid one a visit in awhile, there is seriously no time like the present. The Makeover Event will be taking place this Saturday, May 3 so trot on down to your local Shoppers Drug Mart location to get the details of the event and your tickets! As a quick heads up, Look Good Feel Better is the charity you will be supporting if you visit stores in Alberta, Saskatchewan, Manitoba and the Atlantic provinces. Stores in B.C. and Ontario will be in support of another equally awesome charity – so be sure to pop by, get your beauty on, and support a great cause. 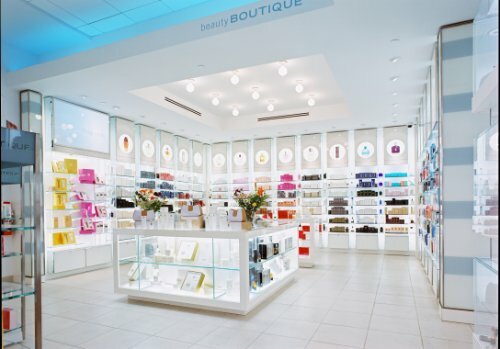 1) Tell me in the comments below by May 24, 2014 – What’s your favourite beauty brand at Shoppers Drug Mart? If you’re unfamiliar, check them out here. 2) Entries are limited to one per person / per email address / per household (or more if you score bonus entries). A random draw will be conducted on or around May 25, 2014 to select the winners, who will have 48 hours to respond before another winner is chosen in their place. 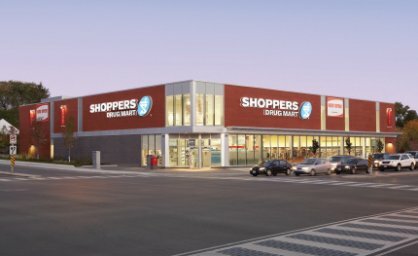 4) Bonus Entry: Congrats early birds – if you catch this post before May 3rd and Tweet about The Makeover Event tagging @ShopprsDrugMart and @LGFBCanada, you can earn up to three bonus entries for each Tweet you share until May 4th. Just be sure to link back to your Tweets in individual comments below. Keep your eyes peeled readers – there may be other ways to earn bonus entries into this fun giveaway as the month rolls on. My favourite brand at SDM is Benefit! My favourite brand is Smashbox. Love perfume, my favourite brand is Balenciaga. My favorite brand is Clinique!! Sally hansen is my favorite brand. My favourite beauty brand at Shoppers Drug Mart is Benefit! My favorite beauty brand is Benefit! Benefit is my fav brand! I don’t’ really have a favourite brand as there are so many to choose from. I do like Essie nail polishes, and some of Lancome’s fragrances. I like the Pur Minerals brand. 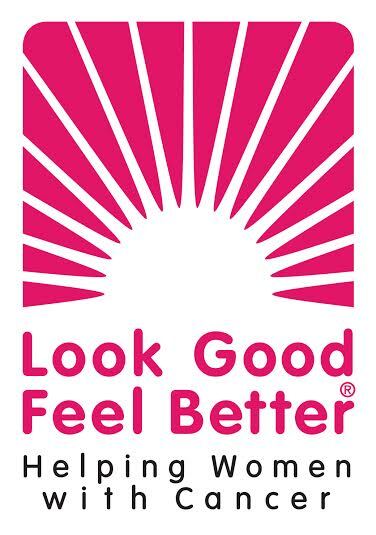 @LGFBCanada Support Look Good Feel Better @ShopprsDrugMart don't miss the Makeover Event May 3rd at Shoppers! I use Clinique for most of my needs. There are so many brands that I love but I’ll have to pick Pürminerals since I use their powder every day! I discovered Vichy Aqualia Thermale line a few years ago, and have been using it since they’re very friendly to sensitive skin and I appreciate the quality from France. I also use Avene for their spa spray, also made in France with a focus on sensitive skin. I love Lise Watier’s Lift & Firm line, blushes, concealer & lip balm/exfoliator from Germany. The beauty associate at Shoppers Drug Mart introduced me to Cover FX for my primers/foundation/concealer when I was looking for something that didn’t have parabens. These brands have worked for my skin care and makeup as quality comes first before style or price. Fave brand @ Shoppers is Biotherm. Thank you & have a good day. 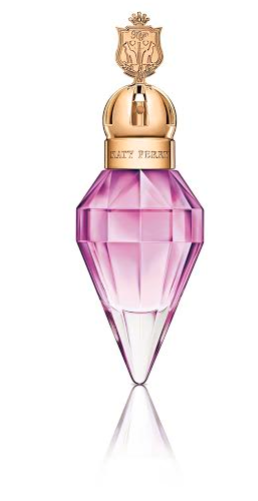 KATY PERRY but only b/c of her new perfume! In LOVE with it! I absolutely love Benefit products. Fun packaging, and incredible quality. I love Guerlain but it is so expensive! My favourite beauty brand is Nivea. Balea brand is great quality and always a winner for me! Burts Bees is my fave! I enjoy Stila cosmetics very much! My favourite brand, at SDM, is Stila. I like Cover Girl products. Urban Decay! They have a ton of fun eyeshadow colours and fantastic primers. And Clarins is really nice for skin care. I really like Quo products. They always feel so good. Loreal- for their makeup and hair color products. I like Soap & Glory the most. I like Stila at Shopper’s. MY fave is the purminerals. My favourite brand is Marcelle. Dolce and Gabbana is my fav fragrance. The light sensual notes make me feel like I’m on a romantic holiday in Italy. I like the PurMinerals line. I love a variety of brands, I am a big fan of Shoppers Drug mart and it’s always my first go to store. I’m becoming fond of Benefit. They have fab and fun make up and colours. I love Benefit cosmetics! Their packaging is always so adorable too! I love a large variety or brands but I would have to say that my favorite is Marc Jacobs! my favourite brand at SDM is GOSH!! Gotta go with Clinique products! I love Sally Hansen for nail products, but am pleased as punch to purchase CoverFX from Shoppers. I feel I look flawless when I wear it! My favorite brand at SDM is Estee Lauder. I love so many of the brands that Shoppers carries (which is why it’s one of my favourite places to shop), especially L’Occitane and Lancome! I love Shoppers, so many fab brands to choose from. My favorite is Benefit! Their products are so much fun and I love their packaging. I’m a fan of Revlon eye makeup. I always buy Cover girl. My favourite brand is Lise Watier. Cover girl is totally my favorite. My favourite brand is Biotherm. I am a fan of Philosophy. It smells great. My favourite brand is Clinque. I love purminerals for my base makeup and certainly love benefit for their innovative products. I love their Quo brand! They are cheaper, but yet still good quality. My favourite lipstick brand is Revlon. So many beauty products to chose from. Biotherm and Clinique are nice. I prefer Cover Girl and Maybeline products myself, with some Oil of Olay items as well. My favourite beauty brand at Shopper’s is Elizabeth Arden. My favourite beauty brand at Shopper’s is Biotherm! My favourite brand that Shoppers Drug Mart carries is Pur Minerals. Love the Quo makeup actually! I’m a Clinque or Estee Lauder girl, but also love Olay. My fave brand at Shoppers Drug Mart is Stila Cosmetics! I prefer Lancome but love other rands as well. Quo is my go-to line. My favourite brand is Clinique, I also like stila. My favourite beauty brand at Shoppers Drug Mart is L’OCCITANE! My favourite makeup brand at Shoppers Drug Mart is Stila. I’ve always loved the Quo products at Shoppers Drug Mart – always a good bet! My favourite brand is Clinique. Clinique is my favourite Shoppers Drug Mart brand. It’s always worked best for me. My favorite beauty brand at Shoppers is Clinique, and also Smashbox is very good. I really like anything from Philosophy!